As far as I know, one can create theorem environments using any of amsthm, ntheorem, thmtools and probably more. How should I define my theorem environments? Is one package clearly superior? Which packages conflict? Is there one package that does everything? (For some reason I am using ntheorem but I cannot remember why). To answer your question of whether ntheorem is clearly superior to amsthm (or the other way round), the answer is unfortunately no as both have advantages and shortcomings. Feature-wise, ntheorem is clearly ahead of amsthm, but amsthm is more robustly designed, and has, as such, less bugs (of course, depending on how you use the ntheorem package, you may never encounter these bugs, but it's better to be aware of them). 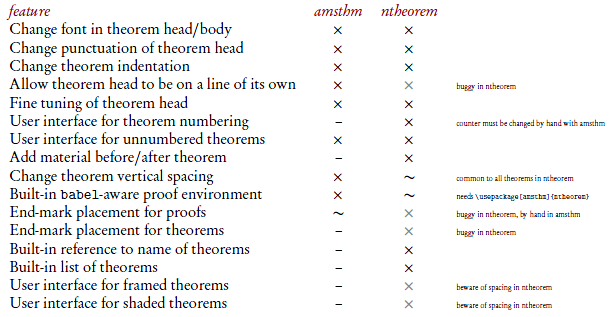 The following table is inspired from the one given in the French FAQ entry about theorem and shows a list of features of each packages, clearly showing that ntheorem can do more things than amsthm. Here are a few chosen bugs which can occur in ntheorem and of which you should be aware before deciding whether to use ntheorem or amsthm. All these bugs are specific to ntheorem and do not occur in amsthm. ntheorem interferes with amsthm but it provides some compatibility if you specify amsthm as option to ntheorem. ntheorem is better in handling endmarks like \qed boxes or symbols, especially if an environment ends with a displayed formula and the endmark should be placed in line. thmtools can be used additionally, it should work with either of the other theorem packages. To sum up, using thmtools together with ntheorem could be the best choice especially if you need endmarks. Though I prefer amsthm, maybe because I'm used to its \newtheoremstyle macro. and you have to do the same thing if an equation is the last line of a proof. But other than a few irritations like that, I think ntheorem works very nicely. Not the answer you're looking for? Browse other questions tagged packages best-practices theorems or ask your own question. How can I get a line break in a theorem headline? How to prevent paragraph breaks after theorem environments? How can I create a customized environment? Mdframed for theorems: how to make fonts similar to amsthm and change title format?